12+In the summer of 1967, Israeli forces seize control of the Gaza Strip and the Sinai Peninsula from Egypt, the West Bank and East Jerusalem from Jordan, and the Golan Heights from Syria. Thousands of Palestinians pour into Jordan, some separated from their families by the chaos of war. Among them are 11-year-old Tarek (Mahmoud Asfa) and his mother, Ghaydaa (Ruba Blal), who wind up in the Harir refugee camp – but Tarek’s father is missing. In her acclaimed drama Salt of This Sea, writer/director Annemarie Jacir used the fugitives-on-the-run genre format to show an American-born woman of Palestinian heritage audaciously claiming her right of return. She does something similar in When I Saw You, but within the framework of a young boy’s wistful romantic fantasy. 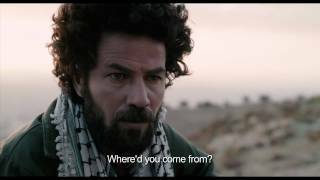 When Tarek runs away from Harir, he discovers a site in the Dibeen Forest where Palestinians from the refugee camps receive military training to liberate their lands. Annemarie Jacir was born in Bethlehem, Palestine. She has worked as an independent filmmaker since 2004 directing and producing short films, including A Post-Oslo History (1998), The Satellite Shooters (2001) and Like Twenty Impossibles (2003). She was named one of Filmmaker magazine’s 25 New Faces of Independent Cinema in 2004. Her acclaimed first feature, Salt of This Sea (2008), won several festival awards. When I Saw You is her second feature.